Throughout the 21st century, rugs have continued to find a place in the modern home, with mass production becoming an efficient way to meet the growing demands of expanding markets. Rugs can now be found in most department stores, as well as online, and come in a large variety of materials and sizes. Kitchen rugs, outdoor rugs, door mats, stair treads and runners are just some of the many different rug types still very popular with U.K consumers. 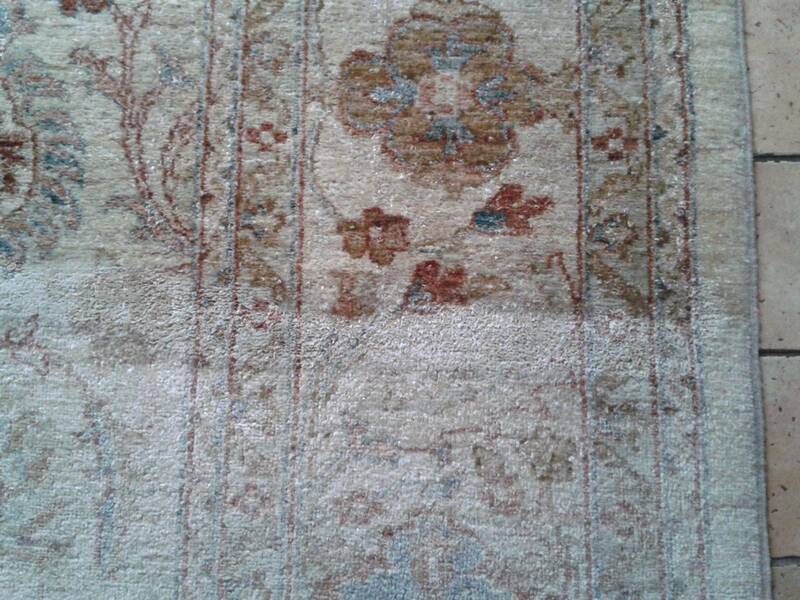 Pre-Inspection - We will check your rug for discoloration of the dies, stains, odors and any pre-existing wear and tear. 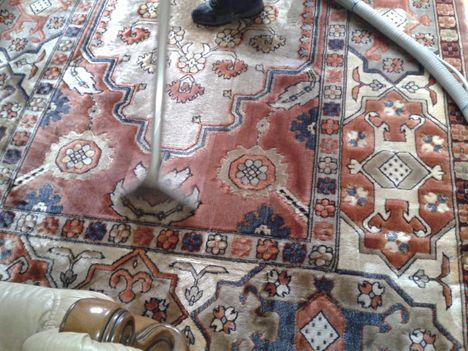 We will explain you the procedure of oriental and area rug cleaning and what results you should anticipate. Dry Soil & Dust Removal - Our dedicated rug cleaners use a vacuum equipped with a powerful three stage motor to remove dirt and dust that are deep down within your rug. Pre-Treatment - The experienced Carpet Cleaners will use special techniques and delicate green biodegradable products to pre-treat vine, urine, and other spots. Washing - Delicate, but powerful solution is sprayed on the sites of heavy traffic. 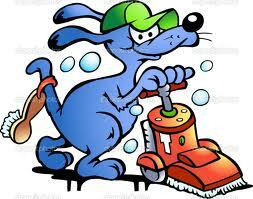 It will allow the dirt particles to be broken down, so our Carpet Cleaners will be able to remove the soil without damaging your rug. Rinsing - Our powerful three-stage vacuum motors work at the highest levels to extract all dislodged dirt and stains. Our machines then collect waste water internally, which is later disposed. You'll be shocked by how much we pick up! Post-Inspection - We will recheck your oriental and area rug inch by inch so there are no stains left (unless it’s permanent spots). 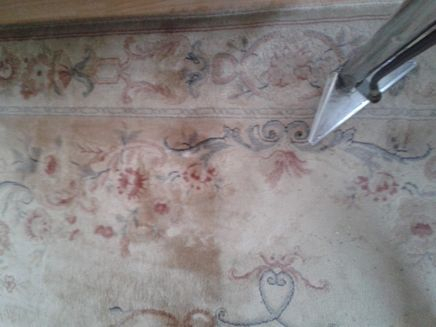 Our skilled technicians will post-groom your area or oriental rug so it will look as good as new or even better. Drying - Following hot water extraction, your rug will be left slightly damp. We usually recommend allowing it to air out naturally. The drying time varies on the type of rug, but most modern rugs take no longer than 2 hours. Rug quality varies depending on the manufacturing process and the materials involved, and a huge variety of contemporary rugs stock the shelves. From nylon, rayon and acetate, to wool, silk and cotton, rugs are made of a variety of materials. Needle Felted Rugs are very durable. Their compact fibers are attracted together via electrostatic means. This type of rug is very new, having only been available for the last three decades. Because of its extreme durability and higher cost, it is often used in high traffic locations rather than homes. Knotted Pile Rugs can be machine or man made, depending on their origins. The thread making up the carpet is pulled through the backing material. Knotted rugs are available in an array of colors and sizes. Woven Rugs are created on a loom, and because of this, they can be stocked with many different coloured yarns. Both loop pile, also known as berber, cut pile rugs and a combination style can be made this way. The loom is the oldest known rug making technique, and continues to be a means of creating attractive, detailed designs. When hand loomed, rugs of this nature can be particularly expensive. Hooked Rugs -- The domain of many a traveller and hobbyist, the hooked rug is a style in which pieces of material are drawn through a burlap backing to create a simple rug. These hooked rugs, while less expensive than their more intricate counterparts, are charming and useful. Flat weave Rugs are made up of threads or long pieces of material, that are woven in and out of the cotton instead of being tied around it. Sometimes, hobbyists make flat weave rugs out of strips of old pieces of clothing, such as jeans. European flat woven carpet types include Damask, Venetian and Dutch styles. Embroidered Rugs are hand stitched onto a cotton or linen backing, held taut by a frame. Royalty joined in too. Mary Queen of Scots was known to have been an avid embroiderer. Some Victorian embroidered rugs feature very realistic, faux three dimensional flowers and other intricate designs. Embroidered rugs were somewhat mass produced when steel needles became available, but have largely remained the domain of craftsmen.